The printing and subsequent issuing of banknotes and other documents. The Bank of Thailand has sole right in doing this by way of the Currency Act. Promoting monetary stability and formulating monetary policies. This includes the determining of interest rates, trading in foreign exchange as required to ensure adequate cash-flow and trading securities for all matters in the country's best financial interest. Management of all BOT assets - other than the assets within the currency reserve - to ensure suitable returns and stability. The Bank of Thailand is also provider of banking facilities to the Thai government - acting as custodian for the government in all matters monetary. This includes financial support and lending facilities for the Ministry of Finance. Financial and regulatory facilities for the major financial institutions. The BOT establishes or supports the establishment of payment system, electronics clearing system, and administers such systems for safety and efficiency. Manage the country’s foreign exchange rate under the foreign exchange system and manage assets in the currency reserve according to the Currency Act. Control the foreign exchange according to the exchange control act. Meanwhile, at street level, Thailand is well catered for with adequate banking and finance facilities throughout the country. Most large shopping centres and malls will have a bank or two at your disposal, and of course the ATM network is probably unsurpassed. Consumer Thai, is very much a cash transaction deal, with cards various, way down the pecking order of payment types. This is bound to change, as the Thai system develops and moves forward to western standards. 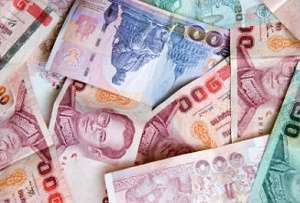 Thai banks will realise the cost of processing hard cash, Thais will become more affluent in the main, and pressure will be put on retailers to start updating their electronic payments systems. In spite of the cards 'commission costs faced by retailers, there will be cost savings to be had by transferring from cash acceptance to plastic. We are not saying this is a good thing - just fact. All of the information contained within this page and subsequent pages, are strictly for information only. We accept no responsibilities for accuracy, but of course we do all we can to verify any content on the site.